How did Etsy come into your life? Well I did a craft fair here in Des Moines (www.craftsaturday.com) and heard about it there, so I investigated the website a little more and then started my own shop. When I first started I did mostly sewn items and a little jewelry, but now am trying to focus on books and prints. What was your involvement in the crafting world before stumbling upon Etsy? Well like I said previously, I did Craft Saturday a couple of times, but before that I did a lot of crafting and making things through 4-H. I was a proud member of the Calmar Creators for 9 years :) Besides that, I was always making, painting, or drawing something. Do you have a day job? Well up until recently I had three part time jobs, in addition to going to school full time, plus Etsy. But gladly, I now can say I have a full time internship for the summer. Then I'll be back to school in the fall, when I'll be working there part-time. Tell us about your shop: Does anyone help you? My shop is my love and obession haha. I love making books and prints---I wish it was my full time job. I don't really have anyone help me persay....sometimes I do ask my wonderful boyfriend for his opinions on certain things I'm creating, but other than that, nope. What advice would you give to newbies on Etsy or in the crafting world? Well I'm still kind of a newbie. Mostly, I'd say do something you love and stick with that---try to specialize in one area or brand your items consistently so not to confuse customers. What's the most challenging part of your crafting? Finding time and money to do it! Do you show your work locally? Just at Craft Saturday fairs occasionally. I would love LOVE to have my work somewhere locally. I hope to apply to some art fairs, etc this year and see what comes of that. Famous last words? "It's my biiiirrrthday!" ----which I repeated frequently on my 21st birthday! 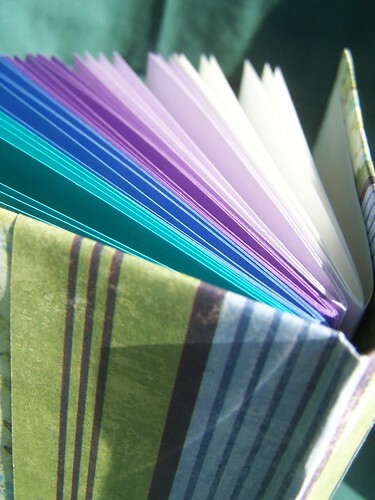 How did you get interested in bookmaking? Lovely Ms. Jones! I took a class at school from Ms. Jones and absolutely loved it! That's all I could think about for that entire semester! Crafting? Probably since I came out of the womb! Lots of people in my family are very crafty. My great-grandma taught me how to sew and I inherited all of her wonderful quilt squares of 70's polyester. And my mom was always making up something for every holiday on the calendar. 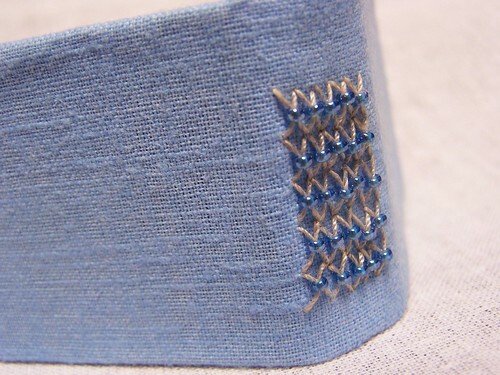 What is your favorite stitch/technique? I really like challenging myself. I like to try and create different stitches to create patterns. I made a coptic book where the stitches formed little diamonds along the spine. I also like the little diamond back book I made that's in my shop. What is the one tool or supply that you couldn't live without? oooh toughie---Can I say my bookbinding bag that has all of my most important tools? Otherwise I'd say my cutting board---I'm so glad I have that thing! Materials you use for your books? Well I worked at a framing shop up until recently and I liked using the scrap matboard to create covers for my books---kind of my way of recycling. Otherwise I love vintage fabrics for covers and great papers-although kind of expensive-are great. I also have found a liking to using wood covers. What inspires you? Well I'm a vintage soul at heart! I collect vintage packaging---it has the best little illustrations! I also have a wonderful boyfriend who owns a record store and has filled the house with records---so I get to see a lot of art that way. I also love roaming through Etsy to find great artists and crafters! Who is your crafting hero? I'd probably say my great-grandma. I have the greatest quilt from her---She made it from lots of 70's clothing, including the outfit my grandma wore to my mom and dad's wedding. It has great color and texture and I love it that she made it for me! Guilty pleasure? I know this is going to sound weird, but I'd say cheese. I love cheese curds and cottage cheese, and basically cheese in general. Maybe its just because I'm cheesy! Outside of food, I'd say crafting supplies. I have a basement full of them that I like to envelop myself in! Great interview, Danielle. Those little longstitch books are great.